Books may be purchased through the Anchorage Museum Shop or Princeton Architectural Press. Alaska was no different from the rest of the country in terms of a need for permanent housing, but it also seemed to have an added burden. Not only did it have its own soldiers returning home from war and starting families, it also had the immigration of men previously stationed in the territory who wanted to make it their new home. These men found Alaska so alluring that they returned home just long enough to gather their families and bring them north. "The problem of housing in Alaska has now grown to such serious proportions that it well may be said to be the most effective deterrent factor to a permanent and stable development of the Territory. The shortage is so acute that we might further say that the evils of the substandard shacks and hovels found in such abundance throughout Alaska are to be passively tolerated as serving a shelter need. With the great influx of people at the beginning of the defense and military activities of World War II, the shortage of homes became a serious problem. With the beginning of peace and the arrival of the permanent settler, the shortage has become catastrophic." Between 1942 and 1945 the people of Anchorage seem to live in harmony with their Quonset neighbors. It was as though they accepted these structures for their part in the war effort. 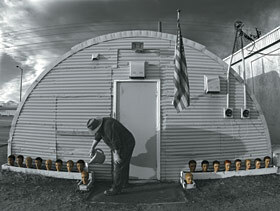 One Quonset camp was erected in the railway yard at Ship Creek, the very birthplace of Anchorage's original tent city. Huts were laid out nearly end-to-end in long rows. Called the "Snake Ranch," this camp was the home of the 714th Railway Operating Battalion, a military contingent deployed to assist the Alaska Railroad in efficient transportation of military supplies. Having served the territory for twenty-five months, the battalion was relieved of duty on May 7, 1945. They were shipped out three days later. Left behind was a village of Quonset huts that stood silent amidst the desperate cries of a housing shortage.